It came from eBay! Been pining for this early Best Film & Video clamshell for quite some time! Congrats! I love this video company I have the hitchhiker exploitation double feature set...in a horrible cut up insert...but still a rarity. Top find. Two extraordinarily compulsive movies in a seriously droolsome package! Shame they dubbed Buono: he's a terrific actor. 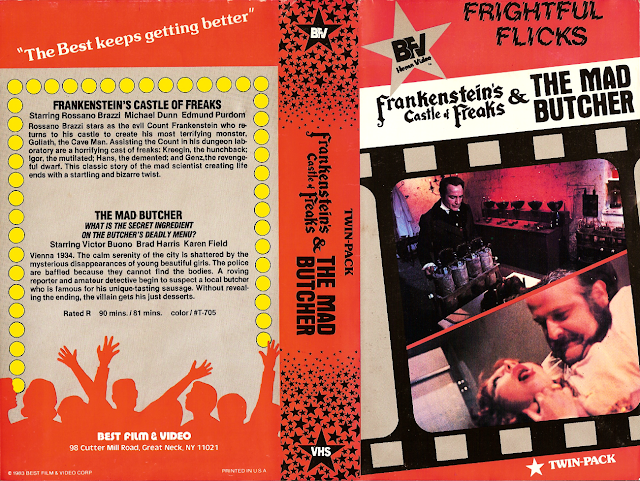 I've got the BFV THE CHILD/DUNGEON OF TERROR double. There's also one for AXE/SCREAM IN THE STREETS, as well as ones for BEHIND LOCKED DOORS (I think that's a double but I don't know the co-feature) and one for MANTIS IN LACE (I think that one's a single). I just got four of those BFV releases in the mail today: HITCHHIKE TO HELL/KIDNAPPED COED, A SCREAM IN THE STREETS/AXE, THE CHILD/DUNGEON OF TERROR, and MANTIS IN LACE/BEHIND CLOSED DOORS (the first movie is labeled as I DISMEMBER MAMA on the cover!). Very excited!